Think of art. Now think of farmers. Did the iconic Grant Wood painting “American Gothic” showing a stern-faced farmer holding a pitchfork, standing next to his equally stern-faced wife come to mind? Think of art again. Now think of food. Did a classic still life come to mind, like the Norton Simon Museum of Art’s Zurbaran’s 1633 still life of lemons, oranges and a rose, or did you see one of Impressionist Paul Cezanne’s sun-lit casual French kitchen tables with bowls of fruit? Now think of food and art. Do beautifully arranged Japanese sushi platters or yummy desserts garnished with dark chocolate shavings and freshly whipped cream come to mind? For centuries, art and food have been intertwined, either through artistic presentations of festive meals, or through paintings, sculpture and decorative arts. This past weekend, art and food were again joined, this time for charity, at the blank annual Venice Art Walk, its elegant donor dinners, wine auctions, and casual outdoor food fair, all benefitting the Venice Family Clinic. To honor this tradition of art joining with food, Fresh From the Farm presents several recipes adopted from California Artists Cookbook, compiled by the Modern Art Council for the San Francisco Museum of Modern Art. The Culver City Farmers Market is the place to shop for the fresh herbs, eggs, vegetables, citrus and avocados featured in this week’s selections. The late photographer Ansel Adams contributed his recipe for sorrel soup. If you’re not acquainted with this wonderfully healthy and somewhat sour tasting herb, you’re in for a taste treat. Blended with plain yogurt and cream, this soup is a lovely and elegant starter for any meal. Painter Karl Benjamin, who made Claremont his home, made use of local fruits and vegetables in his California Sun Salad. Larry Bell, whose sculpture is in the collection of the Los Angeles County Museum of Art, provided a hearty recipe for chili verde. His chili is definitely a make-ahead recipe, but well worth the the time involved. Melt butter in a large, heavy pot over medium heat. Add onion and cook 10 minutes until soft and translucent but not brown. Stir in the sorrel leaves, reduce the heat and simmer until wilted and tender, about 5 minutes. Sprinkle flour over the sorrel and cook 5 minutes longer, stirring often. 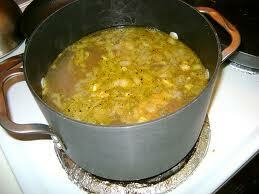 Stir in chicken stock, raise the heat slightly, and cook 10 minutes longer, stirring often. Pour mixture into food processor or blender, a portion at a time, and puree. Return mixture to pot and stir in the yogurt and heavy cream. Season to taste with salt and pepper. Heat just until very hot; do not boil. Trim and wash salad greens, tear into bite-sized pieces and dry thoroughly. Toss in bowl in cheese, green pepper and celery. Chill in refrigerator for an hour or more. In a small bowl, beat together oil, vinegar, mustard, sugar, onion, salt and pepper. Chill in refrigerator for an hour or more. Pour dressing over the salad and toss thoroughly, add orange pieces and avocado, sprinkle with sesame seeds and toss lightly. Heat oil in very large, heavy pot over medium heat. Add onions and stir thoroughly. Reduce heat to very low, cover pot, and steam onions about 20 minutes, stirring once occasionally, until very soft and translucent but not brown. Stir in the garlic, chilies, cinnamon, cloves and the juice of 4 lemons. Raise the heat slightly and simmer uncovered for 45 minutes, stirring occasionally. Lay the pork cubes on top of the chilies, squeeze the juice of the remaining lemons into the mixture. Cover and simmer for an hour. Stir the pork cubes into the chilis, season to taste with salt, add the bay leaves and simmer covered for 3 hours over very low heat. Sculptor Larry Bell suggests that this recipe is best if it is allowed to rest in a cool place with the lid slightly ajar for a full day before serving. It may also be frozen. 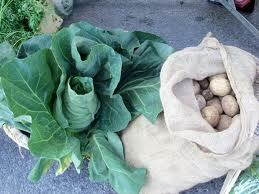 The Culver City Farmers Market is held each Tuesday from 2 pm to 7 pm on Main Street between Venice and Culver Blvds. Katie Malich is the proud owner of “Garden Alphabet,” a water color from local artist KC Koebler purchased at the Gouveneur, New York, Farmers Market.